I spent a long weekend (Fri–Tue) hanging with Jolene in her new digs in Orange County. It’s about a 6 hour drive on Interstate 5 from the East Bay to Los Angeles, then another hour or so on to Orange County. That is of course assuming light traffic, which I learned the hard way is a bad assumption to make. My timing was off and I got into LA right around 5pm on a Friday. Not good. About two hours of creeping forward one car-length at a time and I finally made it to OC. 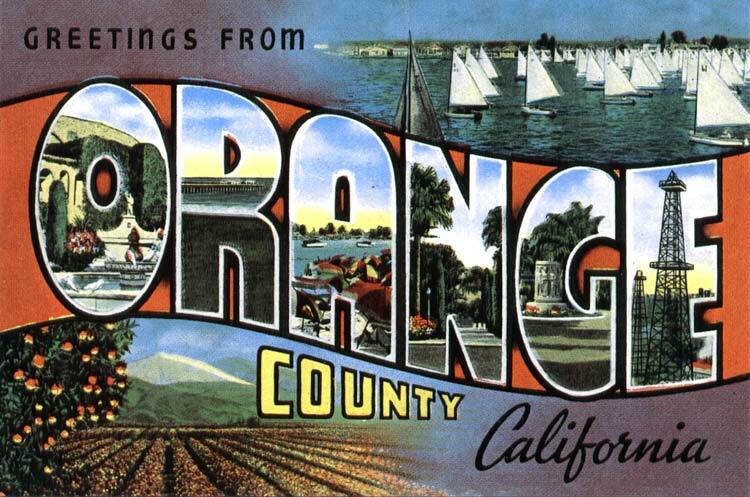 Orange County itself is a lovely area, near the ocean with great beaches if you’re into that sort of thing (I’m not). But it’s also very homogeneous, which is another word for “white.” I don’t think I saw a single building more than 20 years old and the only faces of color were employees in various service industries. Orange County has no culture of its own. It’s a beautiful gated microcosm, isolated from the grit and anger that makes civilization interesting. I picked up the postcard above at a Chevron in Dana Point. According to the blurb on the back, it’s a reproduction of a postcard from the 1930s or 40s. It’s a great visual record of southern California before it got all plastic and hasty. We’re so used to seeing design of that era through black and white photos and movies, we tend to forget that the world did exist in color before 1955. I dig it. But there wasn’t a whole lot of tourism going on, just a weekend chilling with my best friend, shuffling boxes, playing lots of Halo and braving more traffic to pick up various household items discovered for cheap on craigslist. Neither very relaxing nor especially adventurous, but totally worth every minute. This was posted on Wednesday, September 1st, 2004 at 10:44 pm	and is filed under Personal. Comments closed, no pings allowed.